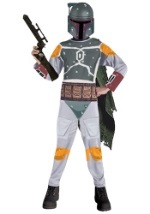 Become a leader in the Clone Wars as Rex in this clone trooper costume for kids. The costume includes a character mask that has slits for easy seeing and breathing. It is white with blue accents and details to give it a worn appearance. It matches the white, polyester jumpsuit that velcros in the back for closure. The jumpsuit has screen-printed accents in blue, grey and black. Boot tops are attached at the bottom to give this costume an authentic look. 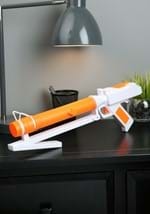 Check out our clone trooper gloves and blasters to add a fun accessory to this Star Wars costume.